Lately every Boston blogger except yours truly has thrown around ideas on how to save the Boston Globe. I won’t discuss whether it deserves to be saved, for the purpose of this article we’ll assume it is a valuable part of the community (both in terms of jobs and journalism) and assume it needs to be saved for the sake of Boston. Bloggers, reporters and citizens have suggested everything from increasing subscription and per paper prices, removing the Globe from Google, scrapping segments, scrapping the print edition and even buying subscriptions out of charity to boost revenues. None of those ideas will work. Here are eight ideas that would work and really save The Boston Globe. Let’s all be honest here, the print edition is not for breaking news. By the time it’s printed half the internet has already mentioned the story and moved on. Cutting these two days out of the schedule will allow for a better product on the days the Globe is printed. Less fluff, more stuff. The people at the top have utterly and completely failed the newspaper. There are no more excuses left for them, they are clearly not so talented that they’re crucial to the future of the Globe. Simply put, the leaders at the Globe have not done their jobs and should not have them anymore. Firing the employees at the top will deliver a significant cost savings and bring new ideas to the table. The union workers have done their jobs. Papers get written, printed and delivered every day. It is not their failure, but a failure at the top. It’s not harsh, it’s reality. The job of the leaders of the Globe is to ensure it is profitable. It’s not profitable so the leaders should be given the boot. Side note, due to the ludicrous nature of most contracts for high level employees, it’s likely that the leaders have clauses in their contracts that activate lucrative severance payouts so this move may not be a huge cost savings but fresh leadership will still do the Globe good. Look, I’m not going to pay the Globe for news. It’s not going to happen. For one, the quality and integrity of their investigative journalism is debatable. Second, the cat is already out of the bag. The Globe and newspapers all around the country already offer their product for free, they will not be successful now taking this free news back and pushing subscriptions on us. But, sports, especially in the City of Boston, is a whole different animal. We are extreme fanatics in this city and devour sports information like no other. Offer a basic sports section for free but for in-depth sports coverage require a small paid subscription. Sure, lots of people won’t buy it and will simply move on to the Herald or ESPN or WEEI or any number of local and national sports outlets, but a significant amount of people will give in to their sports addiction and sign up for premium sports coverage. There are lots of people like me who haven’t bought a physical newspaper in years and don’t plan on ever doing so again. The last time I bought a print newspaper was in 2004 to have a memento of the Sox World Series victory. That’s right, I haven’t bought a newspaper in almost five years. And why should I? I can get updated news for free online in a much more convenient format. Let’s all face facts here, printed subscription numbers are going to keep dropping. The Boston Globe should team up with other newspapers and invest in e-paper to drive its cost down. Another option put forward by Dan Kennedy is to offer all subscribers a Kindle. I’m not opposed to this idea and the Kindle 2 is a great device that is very close to e-paper but perhaps offering Kindles on Boston.com with an Amazon affiliate link is a better way to earn money and convince readers to ditch paper. Boston.com gets almost 6 million unique visitors every month. Add a video news section, keep those visitors there and appeal to a whole new audience. I haven’t watched TV news in forever but would probably tune in to a Boston.com video newscast. It’s worth a shot and could be done for a minimal cost. Hire some of the existing great videobloggers in Boston and integrate them into your site. Videos keep eyeballs at your site and increase what you can charge for ads. And if you’re going to go after Google, don’t forget the other news aggregators of the world. Universal Hub has ads on their site and posts excerpts from articles, they must be stealing! But seriously, work with Google, bloggers and news aggregators to deliver more and more traffic to your site. Don’t place your blame externally, look internally to find the true source of your issues. Sure, newspapers offer free news online but that’s not enough. Stop blaming google and bloggers for your drop in numbers and instead embrace them. Bloggers are often some of the best news consumers, but mainstream newspapers are trashing us and placing the blame for their failures on us. Check out the website for a local newspaper, The Dorchester Reporter, to see how it’s done correctly. The Dot Reporter recently redesigned their entire website with a huge focus on interactivity and local bloggers. They have open comments on every single article on the site and list the latest five posts from area bloggers right on their homepage, with a permanent link back to the blogger. The Globe on the other hand offers comments on some articles and lists less than a handful of local bloggers on their homepage. And after you move off the homepage your link back to your article disappears forever. I know because I’ve been featured on Boston.com a few times now, and while the temporary traffic is nice the next day the link and the traffic disappears. Worse than the loss of traffic is the disappearance of the link back, which is commonly accepted on the web as a form of attribution. It’s a shady, shady move. Large newspapers constantly complain about bloggers “stealing” their content, but then they go right ahead and use an excerpt from my blog (which is what many large newspapers refer to as “stealing) and then don’t provide a permanent link back to my post. In essence, they take my content, use it temporarily, and then ditch the author attribution. So when I use an excerpt from a mainstream newspaper article and link back to it permanently, it’s called stealing. But when they post my excerpt and don’t link back to it permanently it’s called promotion/helping the little guy out. Don’t get me wrong, I appreciate the traffic boost from Boston.com linking to my blog, but I’d appreciate it even more if they provided a permanent link instead of a temporary one. It’s simply good practice and common courtesy on the web. Allow comments on all articles, allow commenters to place an no-followed URL to their site (e.g. like my comment system below and nearly ever other comment system on the web), and for the sake of consistency and clarity provide permanent links to any bloggers you feature or excerpt. It’s the right thing to do and will encourage us to visit your site more often. Plus, your readers can then continue to find my content and aren’t left to wonder who wrote that great post about living car-free for a year. Simple step. Stop promoting gossip, rumors and other non-news. Report just the news and do it well. The real reason your newspaper readership is dropping is because you’re more concerned with stirring the pot or appeasing the elite than reporting the truth. Honestly, mainstream newspapers have taken a stumble down in terms of quality from their glory years. We don’t need the latest celebrity gossip, we do need an authoritative source to find and tell us the truth, not blindly repackage a press release, push it out and call it news. When you need to explicitly describe to your readers what newspapers do instead of showing them, you’re doing something wrong. Thanks to Tony the Misfit for the excellent photo of the Boston Globe headquarters in Dorchester, MA. Disclosure: I occasionally write freelance articles for The Dorchester Reporter. I am not an employee of the paper and all of the views expressed above and anywhere else on this blog are mine and mine only. 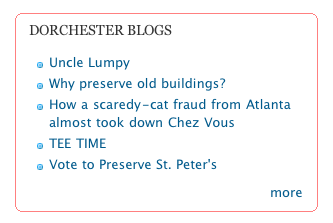 The Dorchester Reporter does not in anyway sponsor, authorize, or have any other relation to this blog or its contents. Haturku thanks for the great post..
here’s what i would propose: let the paper go bankrupt, restructure the union agreements, shut down or dramatically scale back the print version, focus on great hyper-local and regional content, and distribute / syndicate via the web. it’s a painful solution but one that would work in my humble opinion. @OEM, Yes, but the shift to online media should have made it easier for newspapers. It provides them an easy to use, relatively low cast fast distribution method. They can update stories on the fly and deliver breaking news ASAP. Instead, they didn’t realize they need to embrace web culture and instead tried to develop their own culture. @David I agree with Daniel, we can never have enough quality investigative journalism, which is why I read Boston.com and Dotnews.com near daily. It’s a shame that the internet and union workers are being blamed, indirectly, for the financial problems of the Globe. Great points schlaf. The only point I disagree with is letting the paper go bankrupt. I’d rather see it bought out by a local owner(s) before it got to that point simply to avoid the massive job loss that a bankruptcy will entail. Yes, jobs will likely be lost no matter what but a bankruptcy might be the end of the paper for good. Hopefully, they utilize mine and your tips and scale back the paper version and embrace the web and other digital distribution methods (kindle or e-paper). Innovation and moving forward is crucial to the Globe and all newspapers right now. They’re operating on old business models in a new world. This is a great article and tips. Though, I wonder, how could the paper recruit new talent to replace those on top? It’s a difficult sell after the PR the paper industry has received. In regards to pay structure (and I think the same should go for most organizations): Perhaps compensation along the lines of sales people? Offer a draw program with commissions and bonuses based on profitability? Could this attract some innovative and entrepreneurial individuals who are motivated and not afraid of risks? Well Justin, I think you answered your own question. There are tons of entrepreneurs who would jump at the chance to fix the Globe and the newspaper industry in general. That is exactly how they could recruit fresh talent, by incentivizing the position and rewarding quality performance. I also agree with you that many organizations should base their pay structure on performance, not on tenure-ship or rank. There are far too many people who are underpaid but over-perform. These people eventually become demotivated to continue performing at a high level and we all lose because of it. In a truly capitalist system, performance would be the sole basis for payment. We should not base all pay completely on performance in all organizations. There are many jobs where a presence is just as important as performance. For instance, police officers shouldn’t be paid based on how many arrests they make, but rather should be paid to patrol areas and perform their duties well. One could argue that how well they patrol their areas and their arrest accuracy rate could be an indicator of performance but it’s a bit of a slippery slope, especially as officers would then be discouraged from patrolling high crime areas. But, for the example of the newspaper industry, good investigative journalism and introducing a good profitable distribution method for that journalism should be rewarded and if it was many entrepreneurs would jump at the chance to take over. No print edition on Tuesdays and Thursdays – It is kind of sad. I usually have some time before work on Thursday to read a newspaper. Well… It looks like I need to find something else to read, a book maybe. A paper goes well with coffee and cigarette in the morning. Since I quit smoking, I found myself drinking very little coffee, not reading the paper anymore in the mornings, for a little more time in bed. This leaves me to the epapers at work. So I have to agree with you that they should focus more on the epaper and drop the Tuesday and Thursday editions. Not that many people read them anyway. Embracing the internet might be a good idea. The thing is if they knew how they would’ve already done that. And cashing in from the internet is pretty difficult if you don’t know what you’re doing. That’s exactly the reason that newspapers are struggling. Because despite what people like yourself may say, no one gives a crap about actual news. There’s a reason that stuff isn’t in the paper anymore. It’s because no one reads it. When surfing the web and given the choice between a story on LOL cats, or an investigative piece on shady land deals, most people are going to choose the LOL cats. And that’s not what newspapers are for. You say you haven’t bought a newspaper in five years, but there’s no way you’re reading local news coverage online. I can guarantee you have no idea about how your local government works and where your local tax dollars go. Which is why you write about music and pop culture mostly. And guess what, news does break on Tuesdays and Thursdays. Local news. Stuff that impacts you way more than the bloviating political sideshow of national politics. Until bloggers start sitting in on city council meetings, digging through city contracts, harassing sources and local officials and risking million dollar libel lawsuits for their efforts, newspapers are the only places you can read this stuff. The Globe needs to stop giving away it’s content for free. And people need to show some civic pride and get interested in what goes on around them. That’s what will save newspapers. Right now, the Globe is having an identity crisis. They want to be seen as a source for real news but then continue to print stories about celebrity gossip and lol cat stories that will drive web traffic but discredit their journalistic identity. You’re absolutely right that lol cats are not what newspapers are for. Yet, if you read through the Globe there’s tons of silly stories that are not real, actual news. You say we should have civic pride and get interested in what’s going on around us. Well, I think the City of Boston has tons of pride and the citizens are interested in real news but we get confused when we go to what is arguably the most respected newspaper in town and get dowsed with stories about Tom Brady and Giselle or John Henry and his young wife or rumors about vampires at the Latin school and so on. The Globe should pick one side, either deliver real actual news or deliver celebrity gossip. Doing both doesn’t work and makes both sides weaker. I actually wouldn’t be willing to pay for sports. But, I’m betting a good amount of Bostonians would pay for sports. There’s also a plethora of resources online for local news coverage. Check out universalhub.com, which aggregates content from a variety of sources. That and many of the local neighborhood papers are online now. Not saying that news does not break on Tuesdays and Thursdays. What I am saying is that in the 24/7 news cycle brought on by TV and the internet, the newspapers are usually not the first source for breaking news. By the time the print edition rolls around that bit of breaking news has already been broadcast on TV and published on the internet. Trying to keep up with the 24/7 news cycle in print format is a losing battle. I think bloggers are slowly embracing more of a journalist role, but the transition will be slow. For one, a single blogger simply doesn’t have the resources of a major newspaper. There are bloggers who cover city council meetings and try to provide investigative journalism but major newspapers are better prepared to do so right now. Also, you contradict yourself. You say that actual news isn’t in the papers anymore because it doesn’t appeal to the masses but conclude that the major papers are the only places to get actual local news…which is it Matt? I applaud you for placing part of the blame on the Globe for giving away its content for free, but blaming citizens for not wanting to read a publication isn’t the answer. As seen by the uprising of support for the Globe, there is a public demand for real news.